The IF Intermediate Representation based on extending communicating timed automata has been defined for being able to offer a powerful toolset offering simulation, analysis and verification facilities for different modelling languages for distributed real-time systems. The IF plays thus the role of an intermediate representation between high-level standards and verification tools. This representation is expressive enough to capture most of the functional primitives existing in standard languages such as SDL and UML (parallel execution, communication media, complex data, dynamic creation and destruction, parameterization, etc) as well as non-functional aspects related to timing, performance and scheduling. The IF toolset includes front-ends allowing to translate different high-level modelling languages (e.g. SDL and different UML dialects) into the IF intermediate representation. Then it offers a number of backend tools for simulation and verification of IF models, and TGV allows generating test cases for a given test objective. external code integration: the common language provide a simple an elegant way to abstract complex transformations on data through the integration of external code within procedures. The external code to be provided depend on tools used i.e, an executable implementation in order to simulate and model check, or a first-order axiomatic definition in order to use it inside a prover, etc. static analysis: IF provides the dfa tool which implements classical static analysis techniques such as live variable analysis, dead-code elimination and variable elimination (backward slicing) with respect to user-defined criteria. model-checking: The core component of the IF toolbox is the IF simulator allowing to explore the underlying semantic model (i.e, state graph) of an IF specification. Several exploration modes are imlemented: interactive (user-driven), random or exhaustive (breadth-first or depth-first). Partial order reductions can be applied in exhaustive- depth first search. test generation: The IF simulator has been connected to the TGV test generator in the context of the AGEDIS project. See the AGEDIS web page for more details. model: This library gives access to the abstract syntax tree (AST) of IF specifications. It can be used to implement tools operating "statically" on the specification such as translators to other languages, static analysis and optimisations at source level. simulator: A simulation library providing the minimal functionality for on-the-fly state-space traversal (state representation + successors computation) is provided. It can be used to implement tools operating "dynamically" on the specifcation such as exploration tools, model-checkers, simulators, etc. IFx is an extended version of the IF toolbox, developped in the OMEGA project. Simulation: step by step execution, inspection of the system state, conditional breakpoints, scenario rewind/replay, manual resolution of non-determinism, control of scheduling policy and time related parameters, etc. Verification of simple consistency conditions like deadlocks, timelocks, satisfaction of state invariants. The tool is also connected with other tools, such as labelled transition system manipulation tools from the CADP suite (Aldebaran). Verification is performed on-the-fly in the IFx environment and allows the generation of diagnostic traces which can be inspected using the simulator. The architecture of the IFx toolset is depicted below. 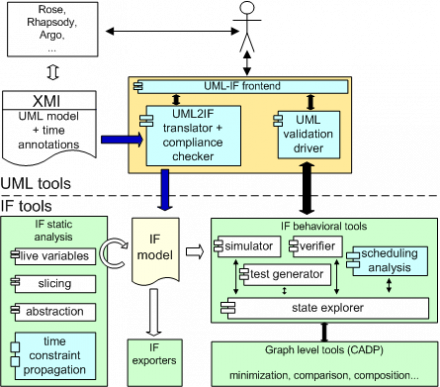 The upper part shows the UML tools specific to IFx, while the lower part shows the components of the IF toolset, including some modules developed in the OMEGA project (in blue). the UML-to-IF translator which takes as input a UML model stored in XMI format. The model may use standard UML constructs and extensions defined by the Omega profile: actions written in the Omega action language, timing annotations and observers expressing model properties (more infomation on the profile). The translator generates an IF specification corresponding to the UML model, according to the Omega semantics. The principles of the translation are described in this paper. the UML front-end provides an interface specifically targeted at UML modelers for the IF validation tools. The interface hides IF and the details of translation and presents simulation and verification results in the vocabulary of the initial UML model. The interface supports all compilation and simulation features mentioned before, and offers customizable views on the analyzed system. 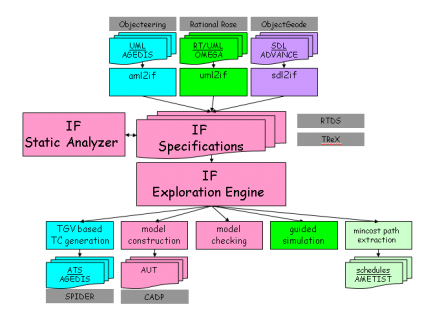 The IFx tool has beeen used to validate the UML model of the Ariane-5 flight software, a case study provided by EADS in the Omega project. Regulation modules which coordinate the behavior of the launcher as a whole and the behavior of each stage. They control events like firing a stage, releasing a component, etc. Guidance, Navigation and Control modules perform the fine-grained control of the launcher’s flight parameters: monitor thrust and other parameters, calculate aiming, etc. to analyze the schedulability of the regulation and the GNC components under the assumption of a fixed priority preemptive scheduling policy. Scheduling objectives were expressed as observers and verified against the model. An example of objective is that the GNC cycle, which repeats every 72ms during the flight, finishes each time. Below are some of the properties which were verified with IFx on the Ariane-5 model. They are expressed as observers. 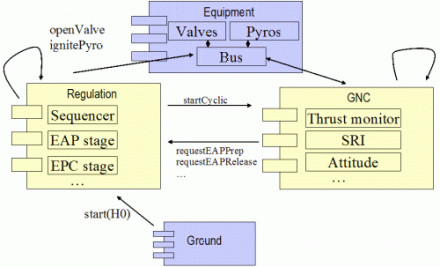 Property 1: Between any two commands sent by the flight software to the valves there should elapse at least 50ms. All instances of class Valve shall reach one of the states Failed_Close or Close after at most 2 seconds since the initial valve failure. The events EAP_Preparation and EAP_Release are never emitted. IF-2.0 Copyright (C) Verimag/IMAG. All rights reserved. This software may be freely used, copied and redistributed without fee for non-commerical purposes provided that this copyright notice is preserved intact on all copies and modified copies. There is no warranty or other guarantee of fitness of this software. It is provided solely "as is". The author disclaims all responsibility and liability with respect to this software’s usage or its effect upon hardware or computer systems. The entire distribution requires 4 MB of disk space. In order to receive download information, please fill the following information. You will receive a notification e-mail with further instructions.